The homeless population in Massachusetts increased faster than in any other state in the nation, rising 40 percent since 2007 even as overall homelessness in the country declined, according to a report issued Thursday by the US Department of Housing and Urban Development. 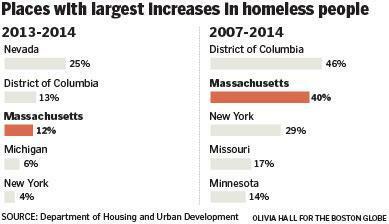 But less than 4 percent of the homeless in Massachusetts live on the streets — one of the lowest rates in the country. Massachusetts is the only state in the country with a “right to shelter” law that entitles every family to a roof over their heads the day they qualify for emergency housing. As a result, the vast majority of the state’s homeless population are in shelters or transitional housing. The rise in homelessness in Massachusetts is due in part to people staying in shelters longer, homeless advocates say, as housing costs, already among the most expensive in the country, continue to climb. State funding for shelters housing individuals, such as the Pine Street Inn in Boston, also remained flat for more than a decade, preventing case managers from helping more people get into subsidized housing. Michael Marino, 46, has been living at the Pine Street Inn for more than a year after a drug problem left him homeless. He has been through one job-training program and just started another, but said it is tough to find an employer willing to hire someone who lives at a shelter. “As soon as you give them the address, they don’t want to hire you,” he said. The homeless figures are based on a survey conducted in Massachusetts and across the nation on a single night in late January. Agencies around Massachusetts reported 21,237 people in shelters, in transitional housing, or on the streets, an increase of more than 2,200, or 12 percent, from last year. Nationwide, the numbers fell more than 2 percent over the year. Across the country, there are about 578,424 homeless people — half of them concentrated in just five states: California, New York, Florida, Texas, and Massachusetts, which accounts for 4 percent of the nation’s homeless. Since 2007, the number of homeless in the United States has declined 11 percent. The overall drop in recent years is due in part to an increased effort to house homeless veterans, according to the Department of Housing and Urban Development. Homelessness among veterans has decreased by 33 percent nationwide since 2010 as federal programs have provided more housing subsidies to them. Housing advocates cited several reasons why homelessness has increased in Massachusetts, against national trends, including housing costs that are rising faster than wages. Many low-wage workers have seen their pay stagnate or decrease in recent years, said Michael Durkin, president of United Way of Massachusetts Bay and Merrimack Valley, and those without savings or other safety nets can easily falter. A serious illness or other setback that forces them to miss work can lead to unpaid rent, eviction, and homelessness. “I think the recession has had a long tail for families on the margins,” he said. Another possible reason for the uptick in homelessness in Massachusetts could stem from opiate addiction, said Joe Finn, president of the Massachusetts Housing and Shelter Alliance, a nonprofit advocacy and policy organization focused on individual homeless people. “I’ve been hearing anecdotes of young people who are entering into the shelter system in the hope that they can access treatment,” he said, because they can’t afford such programs on their own. In Boston, Mayor Martin J. Walsh has announced several recent initiatives to assist low-income people in the city, including increasing funding for low-income housing and launching an office of financial empowerment to help residents with job searches, career development, and financial coaching.